In pot fry cumin seeds, asefotida and methi seeds in oil till brown. Then gradually add besan powder. Continuously stir the besan till it is golden brown. Then add 4 cups of warm water. Continue to stir the besan in water till you have consistency in the liquid. Then add salt, ginger, green chilli, tamarind and spices to the liquid. 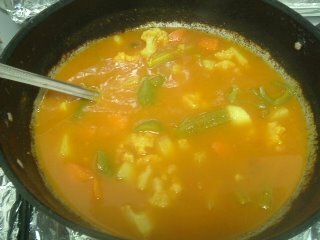 Let the liquid boil and then add vegetables and, curry leaves. Set the heat low and let it slow boil for 15 minutes. Then add mint and cilantro to the liquid.